Iodine Deficiency? You need to know all the facts. Iodine deficiency has become rampant since the introduction of chemicals and additives into our air and food supply. Only now, are the tests surfacing to reveal how our health has been compromised. 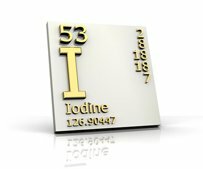 If you believe you have a lack of iodine in your system, you have come to the right place. You may have been given a medical diagnosis for your health issue, when the underlying cause could be a deficiency in this basic element. The lack of iodine has been linked to breast cancer, autism, mental retardation, and hypothyroidism in animals. This site will help you decide if you have a challenge with the iodine levels in your body. There is a simple test for this that you can do at home. You will find protocols to remove the industrial toxins from your body safely and effectively. You will find products for iodine supplementation, products for detoxification, and books which will educate. These can be found in the Site Store with relevant comments. You will learn how to improve you health through the simple addition of natural products. This includes the purification of your home water supply to remove the toxins. The toxins block the uptake of iodine into your system. This can be corrected by adding one simple mineral. Take a look at the "Ask Questions" page. Your question may have already been addressed. If not, feel free to ask or add your comments. We are all in this together and we can learn from each other. Everything in this site is designed to inform and to help you along your Path to reclaimed health.